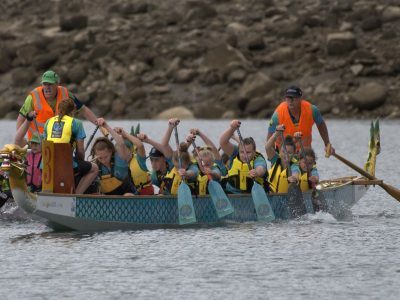 Are you interested in joining a dragon boat club, for fun, fitness or competition? Brave Hearts Dragon Boat Club welcomes you to participate in any of our Pleasure Cruising sessions. There is no fee to try out; all paddles and PFD’s are supplied. WHERE?- The last green shed at the end of Lemke Road, Gateway Lakes, Wodonga. Look for the red dragon boat at the gate. This is our social offering, which focuses on having a fun time. This introductory level is aimed at people who are looking at combining fun and fitness without the pressure of competition. Enjoy an afternoon tea at the conclusion of the session and get to know your fellow paddlers. 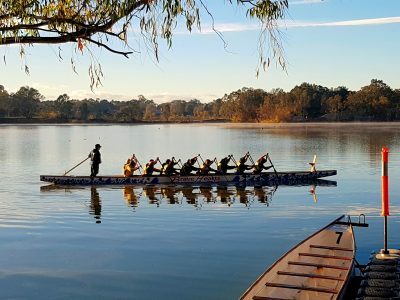 Brave Hearts Dragon Boat Club Albury Wodonga is the longest running dragon boat club on the border. Our club has a rich history, with grass roots as a cancer survivors project for our parent body Brave Hearts on the Murray Inc, we have now grown to become even more. Our club offers sessions for members wanting to paddle socially, for fitness or to compete. 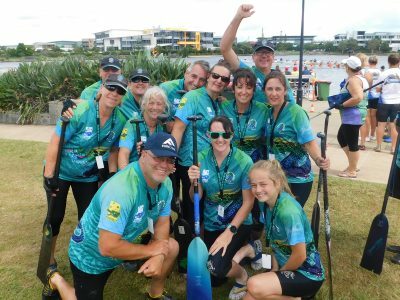 We regularly attend the Dragon Boat Victoria regattas throughout the season, and have paddlers that travel abroad to compete with composite teams…. even the Australian Auroras! one of our Come and Try days. My wife and I had such an enjoyable time at your recent Trivia night, thankyou for putting on such a fantastic night. Thankyou Brave Hearts for making me feel so welcome at your recent Come and Try day, I can’t wait until I can come back again and have another go.